"A knife twisted into the wounds of our previous loss"
A Santa Rosa family whose home was reduced to ashes by the Tubbs Fire went to a concert benefiting North Bay fire victims like themselves, only to suffer yet another heartbreaking loss. 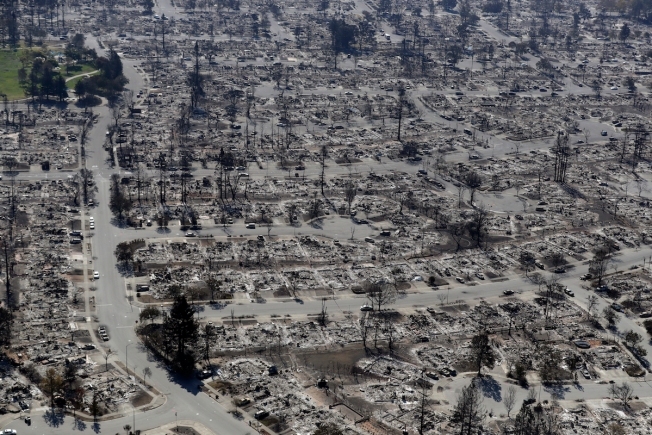 Jason Kracht lived in Coffey Park with his wife and 3-year-old daughter until California's deadliest wildfire laid waste to thousands of homes across wine country. Coincidentally, the trio had transferred digital copies of their family pictures to a new laptop — which was among the few items they were able to save — before the wind-whipped flames gutted their house. The original photographs were lost in the fire. On Thursday, the Krachts went to AT&T Park in San Francisco for the Band Together Bay Area concert, where Metallica, Dead and Company, Dave Matthews, Raphael Saadiq, Rancid and G-Eazy performed to raise money for people who suffered losses due to the wildfires. However, they left the show and made an alarming discovery, Kracht said. Someone had broken the rear passenger window of their vehicle, flipped a lever to drop a car seat and taken off with a suitcase and three briefcases that had been stored at the back of the family's car, according to Kracht. Among the stolen items was a 13-inch Acer laptop that stored all their precious memories, Kracht said. "That computer had the only copy of many of the pictures and videos of our daughter as she conquered her liver transplant and has continued to grow into a thriving 3-year-old," he said. A Dell Precision laptop, an Apple Macbook and Samsung Galaxy tablet were also robbed. The family is working with the San Francico Police Department and Kracht said that investigators are trying to get surveillance video from an armored car company across the street from they were parked. He also asked for the public's assistance. "After losing nearly everything in the Tubbs fire on October 9, having these photos (on the computer) stolen from us has felt like having a knife twisted into the wounds of our previous loss," Kracht said.